We are here to help with ALL your pet care needs! One wag at a time, we are making pets and pawrents happy! have to leave them alone for long periods of time? BOOK EARLY FOR BEST AVAILABILITY!!! DID YOU KNOW THAT WE WILL CARE FOR RABBITS, SMALL BIRDS AND FRESH WATER FISH IN ADDITION TO DOGS AND CATS? PET SITTING IS A PLEASURE AND YOUR ANIMALS STAY SAFE AT HOME. . .WE VISIT 2-4 TIMES A DAY. ASK FOR DETAILS & AVAILABILITY AS YOU PLAN YOUR VACATIONS! Welcome to Pawesome Pals . . .
Recurring clients that book 1/2 HOUR routine visits 3 x a week or more receive discounted rates...ASK FOR DETAILS! Please complete the comment form to the left for a quick connect with us! We look forward to hearing from you! Welcome & Big Nose Pokes to all our visitors! 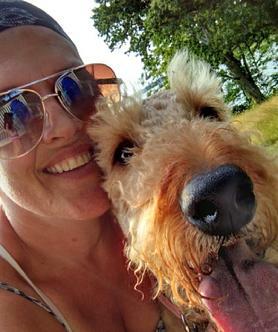 Our mascots, the Owner's Airedale Terriers, will likely provide you with a new doggie vocabulary and funny happenings to keep you entertained. "Big Nose Pokes" are typical in an Airedale greeting - they simply must poke you with their nose to say hello! Here at Pawesome Pals we feel that every dog, cat and household pet deserves the same love and care that you would deliver yourself. When you can't be there, we can! We provide PET CARE AND DOG WALKING services in the following areas: Kingston. Hanson, Pembroke, Hanover, Norwell, AND MORE. If our general scheduling permits, we may be able to accommodate clients in other neighboring areas, so please, just ask! We look forward to providing the same caring and nurturing attention for your pets that you would give them yourselves. We know it is often hard to leave your best friend home alone all day or take that 3-day trip without having a reliable solution to the question, "Who will look after my pets?" Please visit our Pawesome Services Page and About Dog Walks to see the detailed descriptions of OUR DOG WALK AND PET SITTING SERVICES and how you can benefit from our presence when you are not home yourself! Please note that we are FULLY INSURED for your peace of mind. We are members of Professional United Pet Sitters and Pet Sitters International as well. Our consultation is easy and is free; we want to be sure we are good fit with your pets. Please feel free to send us an inquiry to info@pawesomepals.com . Our Owner will contact you with more information and to answer any questions you may have. Please be sure to leave your complete contact information, where you live and what you are interested in for pet care and dog walking services so we may anticipate how to best assist you. After an initial phone consultation we will schedule an in-person meeting with you & your pets. Generally, we require meeting our clients and their pets prior to beginning services for everyone's comfort! We look forward to caring for your pets. We hope you browse our site and see that we are as concerned for your pets as you are. We come to your home where your pet is most comfortable, that is what sets our services apart from others. We never walk more than 2 or 3 dogs at a time ~ this way your pet gets the attention and nurturing they deserve when we visit. Our website will provide you with a menu of services & rates and answer many of your general questions. Please see our pet "tid bits"and our newsletter. We hope to be more than just a pet care service provider, we hope to inspire and educate as well as support and encourage all of our area pet owners and pets. We believe that walks are both necessary & beneficial to your dog's well being. Isn't exercise good for us all? Our pet sitting services are a great alternative to traditional kennels and provide the same personal and attentive care you would give yourself. Enjoy! P. S. Please be sure to enter your information in the comment form to reach us or to be added to our e-newsletter! Thank you for your interest in Pawesome Pals!